My review of Outland is up at thephoenix.com. I'm always late to the party with my reviews, since I rarely get advance copies, but in this case it seemed even later than usual. The version I played, on Xbox Live Arcade, has been out since April 27. But in this case, Sony's loss is my gain. Thanks to the PlayStation Network outage, Outland will be out next Tuesday for PSN -- which makes this review timely as hell. PSN owners, if you want the short version: thumbs up! Blessedly, I don't have too much to add to what I said in the review. I just thought this game felt great in my hands. So if the levels seem sparsely populated at times, that's all the better because it is such a joy to move through the space. Then, when you hit the frequent difficulty spikes, you at least feel equipped to get past them with enough honest effort. It's not one of those games whose sole purpose is to keep tricking you into getting killed -- ahem, ahem. 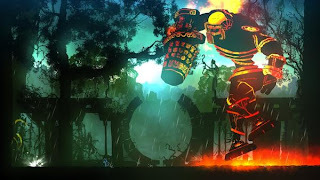 It is a strange transition sometimes between the Metroidvania stuff and the bullet hell stuff, and while a lot of positive reviews of Outland have called them two great tastes that taste great together, I don't know if I'd go that far. It's more like two great tastes that taste great near each other. Only during the boss battles do the two modes of play really seem integrated, and even then the only exploration you're doing is probing for weaknesses. No matter. Both are expertly executed. Sadly, I was not able to try the co-op modes, since no one on my friends list had the game, and playing with strangers gives me heart palpitations. Given how much I liked the single-player campaign, my feeling is that the multiplayer could only be a bonus. If co-op is inferior, well, then you've still got an awesome one-player game. And if it's terrific, all the better! All right, let's all go back to reading 8,000 identical Tweets from an E3 press conference. Your insistence on beating this dead horse isn't endearing. And I like you much better when you're endearing! Thanks for providing this information. I really liked it, keep up the good work. very nice blogger template.